COVENTRY City’s shortcomings in front of goal have returned to harm their play-offs push. 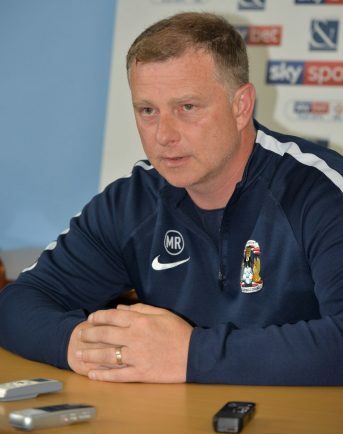 Despite much quality approach play, a home draw against Peterborough United and Tuesday night’s 3-0 defeat at Fleetwood Town have left Mark Robins’ men five points outside the top six going into a weekend off. Lack of prowess and composure in front of goal, and in the final third, was particularly evident at the Ricoh on Saturday, when only three shots on target dampened an otherwise promising attacking team display. The same could be said for Tuesday night’s first half, when young midfielders Tom Bayliss and Luke Thomas were at the centre of much swift counter-attacking and quality passing. Striker Conor Chaplin missed the best chance of the half as his near-post shot was well saved by keeper Cairns’ leg. Chaplin’s woeful penalty miss, blasted over the bar, after Fleetwood’s three second half goals, was the nadir of another worryingly inferior second half performance by the Sky Blues. Chaplin had been man of the match against Peterborough with excellent passing and movement, and work-rate. He had got his goal in stoppage time after Posh had appeared to win the game with a 90th minute goal after Michael Doyle’s misplaced pass. Poor defending undid Coventry at Fleetwood for the first two goals from Dean Marney and Wes Burns (Ched Evans getting the third). Left back Junior Brown and centre-half Jordan Willis missed opportunities to clear the lines or get tight enough in marking. Robins said after the Fleetwood game: ‘’Their keeper got man of the match. That tells its own story. ‘’In the first half we more than edged the game, we passed the ball a lot better, moved forward well, made chances and had good possession in good areas of the pitch. But after the hard work we were picking the wrong option. “We know what we have and where we are in terms of players and player qualities, but second half was defensively not good enough today. ‘’Looking at them the way they’ve set up and come out, Paddy Madden and Ched Evans are top strikers in this division. Give them a chance and they’ll more than likely score. “We limited Evans. He had a chance in first half which Lee Burge saved well, so besides his goal he didn’t threaten a great deal. ‘’Willis came out into the second half looking injured. His knee was sore to the point he had to come off but in doing so we concede the first goal, we were out of position. ‘’…Obviously we had the penalty which we missed, but we weren’t short of creating chances.